Animals can forge bonds across species boundaries if the need for social contact. In some cases there are odd couples, a cheetah and a dog are shown as friends. Cats can be best friends with other cats, humans, dogs, bunnies, even birds. In the Animal Kingdom, there is the predator and the prey. Although nature dictates that such is the relationship of each species under the Animal Kingdom, there are instances that proves it wrong. Here is a concrete example of some of these charming animals who despite being on the opposite sides of the food chain can also become the best of friends. 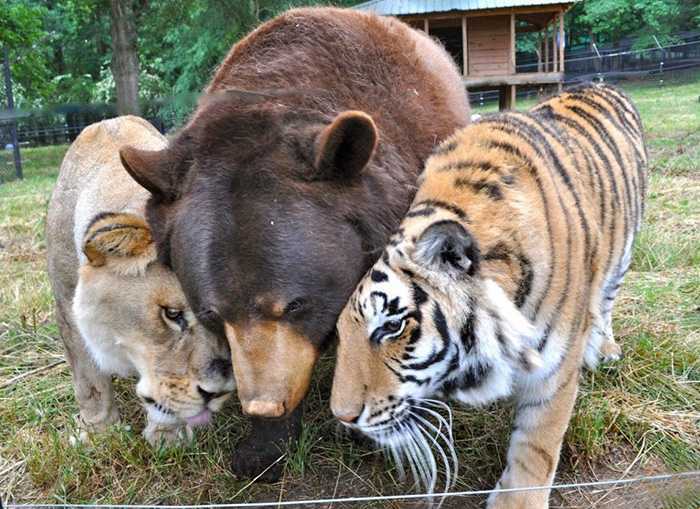 This bear, tiger, and lion have the best relationship ever, they’re friends and not preys-predators. 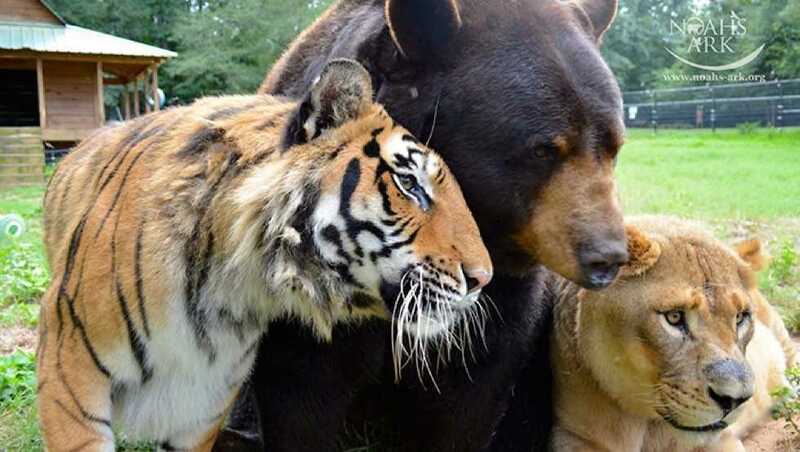 These animals would never coexist in the same place in their natural wild habitat, but Baloo the bear, Leo the lion and Shere Khan the tiger have spent more than 15 years coexisting at Noah’s Ark Animal Shelter in Georgia very happily without a single fight. Baloo, Leo, and Shere Khan were kept in the basement in a very terrible condition and Baloo even had to have surgery to remove an ingrowing harness. In that critical time, the three friends had to be parted. 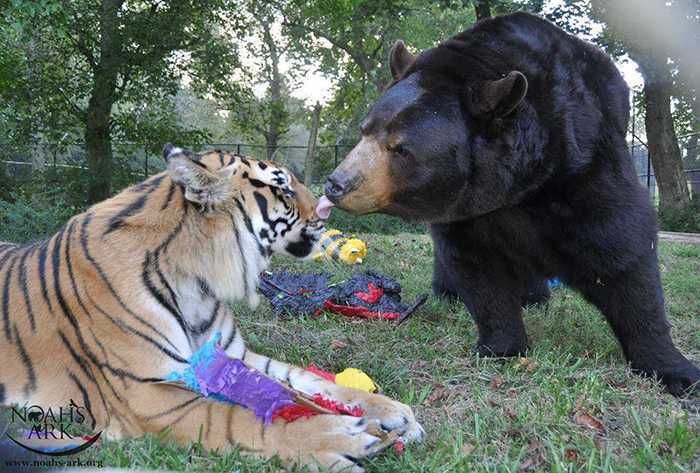 They haven’t left each other’s side for years, Baloo, Leo, and Shere Khan happily spent their days together after the bear’s surgery. They grew together and always played a supporting role during tough times, the trio shows that they are best friends forever. 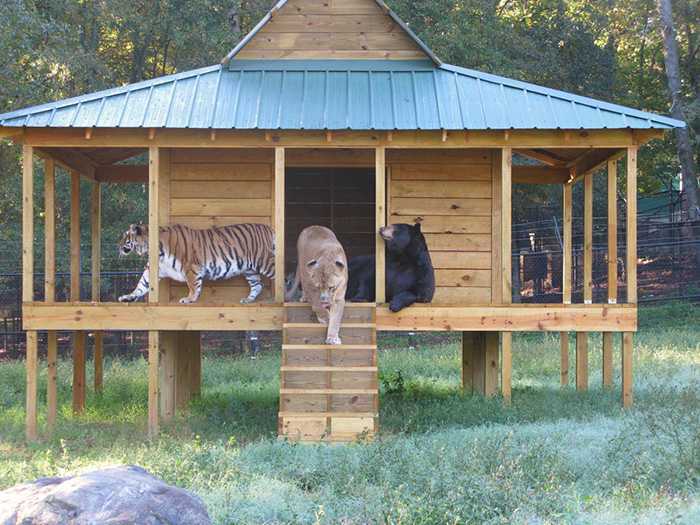 After being rescued, all the bear, the lion, and the tiger are too injured to be rehabilitated and returned to the wild, so Noah’s Ark Animal Shelter gave them a forever home at the sanctuary and the trio seemed very comfortable and adjusted well in this new environment. 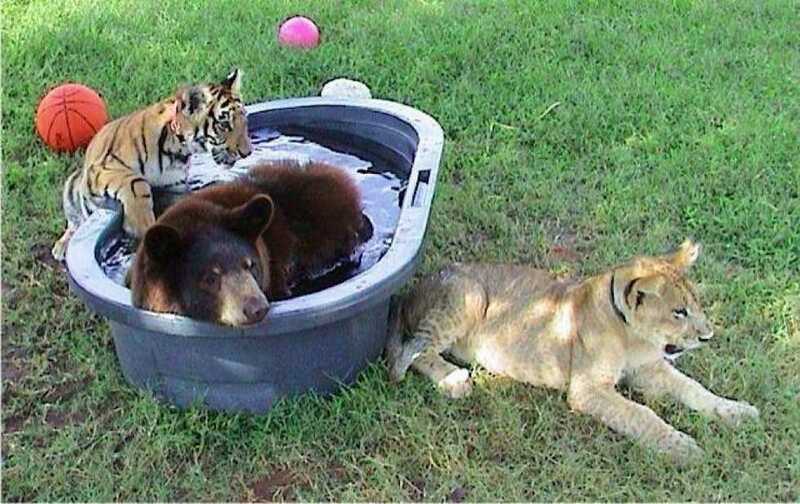 These animals were rescued in 2001 from the basement of a house in Atlanta during a police drug raid. They didn’t know that they are going to start an amazing friendship together. It seems that they’re born as triplets. 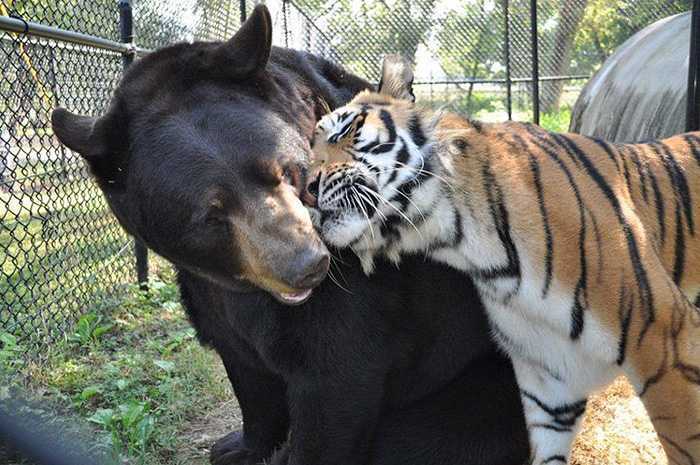 These unlike animals are friends forever. They are very affectionate towards each other. Watch this beautiful friendship in the video below!